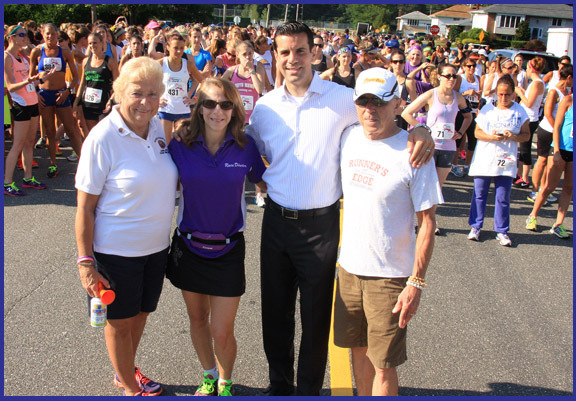 Nassau County Legislator Michael Venditto recently attended the 31st annual Long Island Women’s 5 kilometer run in Farmingdale. More than 500 women competed in this year’s race.“It’s great to see so many people from the Farmingdale community come out and be part of this year’s run,” said Legislator Venditto. Before the race, Legislator Venditto joined with Legislator Rose Marie Walker and the Greater Long Island Running Club’s Amy Goldstein to hold a Fun Run around the Farmingdale High School track for kids 12 and under. Shown in photo, left to right: Legislator Rose Marie Walker, Race Director Debbie Blair, Legislator Venditto, and Bob Cook, owner of Runner’s Edge Shoes & Sports Apparel.